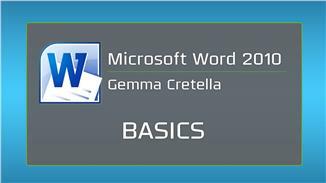 Get inspired and be creative by unlocking the full range of functionality of Microsoft Word 2010. This course will teach you the basics from the interface and ribbons to working with pictures, tables and graphics. Creating a clear, legible and accurate business document is a critical skill for professionals. Learn the essentials of this popular document creation software. This course will cover the must-know fundamentals as well as special tips to give your project stand-out creativity. Exploring the interface and understanding the ribbon. Basic operations for creating, saving and printing documents. How to set tabs for documents. Techniques to add and design a table. Ways to work with graphic elements and insert pictures and art. Tips to use the header and footer group. How to work with the various page layout options. The spell check and word count functions and why they matter. The tools and techniques for the editing group.